I pulled down the Safari beta and installed it on my MacBook Pro, which has 4GB of RAM and is running the latest version of Leopard. By default it installed over my existing version of Safari which I wasn't too happy about. You can uninstall it and it will roll back to your previous version if you need it to but I would have liked to be able to run both concurrently. I'm sure there's a strong technical reason that's not an option. Quite a few users complained about problems with Mail.app, especially if they used Growl for notification support. In my limited time looking at it I didn't experience any problems with Mail. Your mileage may vary. Typical of something from a Finder or iTunes Cover Flow view you can have nicely rendered mini web pages on a large black background that give you a menu of sorts for your most used web pages. While you can "pin" web pages into the view, move and remove those that you don't like, the current beta doesn't give you the ability to put a site in that you want. You have to hope it comes up for it to appear in the list and then pin it. Hopefully this is just a function of it being beta software. I was furiously removing sites and hoping Safari would give me one of my more recently visited sites but after a while it stopped offering suggestions (hence the gap where two web pages are missing in the image above). There are small, medium and large views that hold 24, 12 and 6 web pages respectively. By default this is your home page so it will come up quite a bit, though you can of course set your home page to anything you like. There's also a little button on the left of the toolbar that gives you quick access to it. Dan Frakes at Macworld has a really good article about Safari's new tabs: Good or bad? He covers this topic in a lot more detail than I do. I would love to see Apple add an option that would allow me to turn off the close button for non-selected tabs. That would mean less of a chance of hitting the mole, er, close box on accident. With screen real estate always such a premium I do like the way Apple is tackling this though; it just needs a little tuning. Since this is going to set the standard for OS X tab metaphors moving into the future I'm sure Apple appreciates the gravity of these kinds of decisions. There is one add-on I use in both Firefox and Safari religiously and that's 1Password. Unfortunately it needed to be updated once the beta was released; fortunately the Agile Web Solutions folks knocked out an update within days that fixed it. There are other plugins that have needed to be updated as well but most of the popular ones appear to have been patched already. All in all I'm pretty pleased with this new version of Safari, especially when taking into account that it's a beta release. I don't know if I'll switch from Firefox being my default browser, though if Apple can tweak some of the UI issues and still maintain that incredible speed advantage I may just reconsider that. What's your take? Do you like the new Safari? 1. Open top sites and another blank tab/window. 2. In the blank tab/window, open the site you wanted to add. 3. In the top sites tab, click edit. 4. Drag the proxy icon or the url or the favicon of the site you wanted to add into the top sites grid. If you think about it, it actually make sense. It's all about drag-and-drop in mac os, but then I won't mind having an extra "+" button besides "Edit". And as a side note, I use safari for everyday browsing and firefox for web development. I "locked" firefox to my web dev space. This works well enough for me as I really don't need that much plug-ins (firebug+Y! Slow+Web Developer toolbar). This might change though, as the improved web inspector in Safari 4 looks pretty decent and I might actually be able to ditch firebug for it..
@Godfrey: Thanks for that tip on Top Sites. It's really difficult to figure out and even with your directions I couldn't get it to work. I would try to click on the tab that contained the page I would like to add to Top Sites and it would automatically select it. The only way I could get it to work was by selecting the entire URL I wanted to add to Top Sites, copy it to the clipboard, the select the Top Sites tab, click Edit, paste the URL into the Top Sites tab address area (and NOT hit enter), then drag that address into the grid. It really felt clunky so I hope they make this easier or more intuitive. Dave, the easiest way to add sites to the Top Sites page is to have two "windows" open, one with Top Sites and the other with the site you wan to add. Then it's just a matter of dragging the favicon from the site you want to add to the Top Sites window. That said, they need a better way to do this. Maybe a "+" button that will bring up a list of bookmarks to choose from. My overall opinion of the update to Safari was one of horror when I found it next to impossible to switch tabs without accidentally moving the window around. I also found myself moving the window when I was trying to move the tab to a different location or tear it off the tab bar completely. I finally used the "defaults" setting to move the tabs back to where they normally are. In fact, I have pretty much put all the UI changes back to the Safari 3.x settings. I am keeping the Top Sites feature, but I put the progress bar in address bar back and the refresh/stop button back in the toolbar. I was very impressed at the speed that the folks that do plugins and Input Managers for Safari updated their tools for this version. I was only without my plugins for about 2 days before everyone had new updates. If Apple is going to take this approach of putting tabs in the title bar, I'm going to have some serious issues with Apple in the near future. I just hope that the other apps that take this UI change on allow their users to put the tabs back if they want to. I installed the new version as soon as I found out about it. Admittedly the new tab location is a little difficult to get used to, but as you said, the slightly greater browser real estate is noticeable. It's clean and quick. I expect there is some learning to do yet, but I'm reading there are a lot of "terminal" tweaks that can help you customize your experience. Another option is to stick with Safari 3 and run the nightly builds, you get all the non-UI features of Safari 4 (new JS engine, the Acid3 compliance, HTML5, CSS3, Database, etc.) — you don't get the new tabs and search. But, and this is the big one, you don't change the renderer for every other program on your Mac that includes WebKit (I have been finding compatibility issues with various programs, most recently Fluid which uses the WebKit engine, and the Mail.app issues, and I am sure it would effect iCab as well). What's interesting is that this seems to me to be a 'Chrome catch-up' release. Most of the things quoted in the article - speed (Chrome is almost as fast), tab handling, start-up site view etc. - have all been available through Chrome for a while on other platforms. As Chrome is open source and uses WebKit the Safari code could even be based on it. You folks might want to give Chrome a whirl (as it should coming on the Mac also) and Chrome has the cross platform thing working for it a little more strongly than Safari (Safari has been a sizable security risk on Windows and so is difficult to recommend there). Google also has a better framework for ensuring compatability to web-sites via the use of their web-site cache. 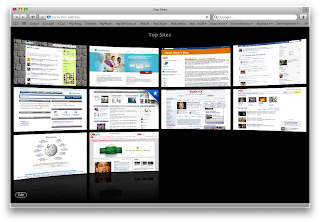 I switched from Firefox to Safari 4 Beta in order to test it as deep as I could. So far, I found out some bugs (Safari crashing but with an hard-to-find-reason, no plug-ins installed aside from that Flash 10 rubbish....), and I have the same complain as the others with the window title bar+tabs, it always takes 2 clicks to activate the right tab or I need to press the button slower than used to. @Eytan: Thanks for the details - very helpful. I'm really not sold on this new UI model. I do think this is going to be MUCH hard for the non-technical user to deal with. I'm going to try an experiment and upgrade my wife's browser to the latest beta and see how she likes it. Should be interesting. I've ALWAYS hated Firefox. UI wise, it's not as powerful as Opera (which the 'top sites' feature is cribbed from; so are tabs, when you get right down to it) but it's more cluttered than I'd like for the lack of power. When Chrome came out, I started using it on Windows, and I liked it quite a lot. I discovered that it absolutely MURDERS performance on my machine though (an 8-core, 4GB box). I had been having problems with Safari at home, so I've been switching browsers every 2 or 3 weeks for the last few months. Eventually, I had to settle on FF3 because it really was just working the best. I LOVE the new Safari. It's smoother than Chrome, though it's buggy. I use it at home on my Mac and at work on my PC. It handles large numbers (30+) of tabs being opened at the same time without much issue, and the UI is beautifully minimal. In Windows, it automatically hides the menu bar, but if you tap alt, it brings it back. The google search recommendations are as good as any 3rd party add-on that I've used, and while it doesn't automatically restore your last session, there's an option to do that in the History menu. I've switched back to Safari. Safari 3 on Windows was such a complete waste of time, but this is honestly a much better option. Hierarchically, having the tabs at the top of the window (above the location bar) makes total sense. I like this decision from that standpoint, as well. And I'm hoping this will make the Mac Firefox team focus on speed. I love lots of things about FF, but it's relatively slow speed is a constant pain. perfect!! I like that, safari 4 beta..! !